The espresso counter. Photo: Dana Massey-Todd. © tablehopper.com. GreenSalads.org and Lt. Waffle. Photo: Dana Massey-Todd. © tablehopper.com. 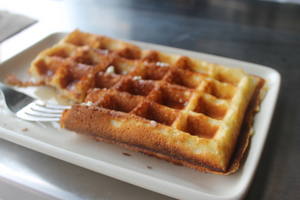 The classic Brussels-style waffle. Photo: Dana Massey-Todd. © tablehopper.com. A report by Dana Massey-Todd. As previously reported on tablehopper, the Mission is getting a new espresso bar, ~LINEA CAFFE~. The pint-size espresso bar lives in the back of Duc Loi Supermarket, and is a collaboration between Andrew Barnett (the founder of Ecco Caffe), and Anthony Myint of Mission Chinese, Commonwealth, and Mission Bowling Club. Barnett is running the espresso bar, which is focused on meticulously pulled shots from the La Marzocco Linea machine. They’re roasting all their own coffee (though not on-site; the magic happens at Highwire’s facility in Emeryville), using beans from some of Barnett’s favorite farmers from around the world. The focus—in both the roasting and preparation of the drinks—is on enhancing the natural sweetness in coffee. There is no drip or pour-over option here; it’s all espresso, all the time. Beans will also be available to take home, with a rotating roster of single-origin roasts. On the food side, Myint has two different concepts going on: GreenSalads.org, which offers a mix of salad choices, and Lt. Waffle, a Brussels-style yeasted waffle stand. The salads include choices like a chopped salad with romaine, tortilla strips, radish, and ranch dressing, or a rice salad ($9) with avocado, brown rice, shiitake mushrooms, broccoli, pumpkin seeds, and cucumber ($8). All salads are available with bacon, chicken, or chicharones, as well. In the waffle department, look for sweet offerings, like the classic with butter and syrup ($5)—which is available with toppings like coconut jam, gianduia, and macadamia—or yogurt and seasonal fruit. There are also savory choices, like the pastrami waffle, which is a potato batter waffle with pastrami (from Mission Chinese) and sauerkraut. 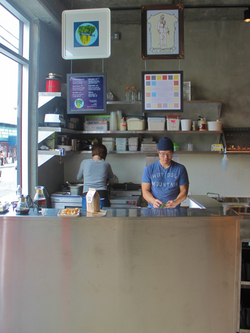 All items will be served in to-go containers for takeout or to enjoy on the espresso counter on the exterior wall. 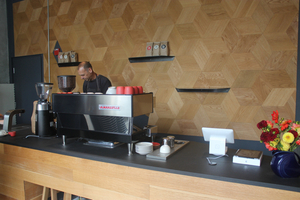 The design of the tiny (290 square feet) space is sleek and modern, with blonde wood in a hexagonal pattern on the wall behind the espresso bar. The kitchen backsplash is hexagonal white tile too. The exterior walls are windows (one side hadn’t been installed during my visit), and an espresso counter will line one of the walls. They officially open Wednesday September 18th (with limited menu choices), and hours are 8am-3pm daily. 3417 18th St. at San Carlos.